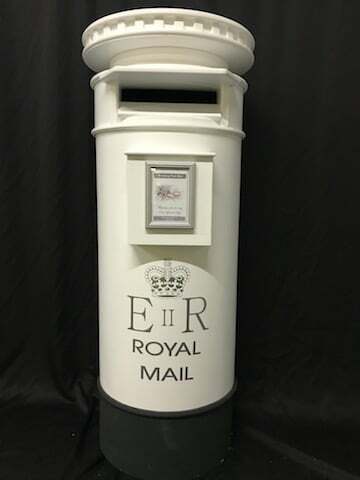 Full size Royal Mail Wedding Post Box for your Wedding Day to collect your cards and guests messages. Based on the original British Royal Mail Post Box, still seen throughout the UK today, these great post boxes are available for hire to enhance your gift table at any special occasion. White Post Box: White royal mail post box looks stunning at wedding receptions. 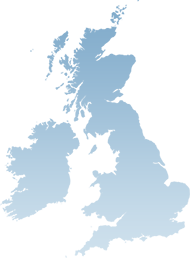 – White with silver lettering, perfect to fit in with your colour scheme. These Post Boxes are constructed from light yet strong fibre glass resin material featuring lockable access door. Available to hire from £40. Red Post Box: the traditional red post box as seen throughout the country – Royal Mail red with gold lettering. These Post Boxes are constructed from light yet strong fibre glass resin material featuring lockable access door. 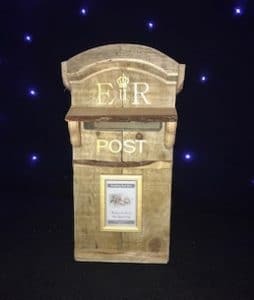 Rustic Post Box: Hand made in reclaimed timber looks stunning at Rustic Theme Weddings. Featuring lockable access rear door. Full Height White 5ft Post Box: the traditional full height 5ft tall replica white post box. Featuring lockable access rear door.